It's the dawning of the age of the Lumbersexual. "The what?" you may ask. Think outdoorsy (or pseudo outdoorsy) gents who like to stay groomed. Rough and tumble, but cleaner. A fancy lumberjack if you will. And what's more appropriate for such gents than a beard oil? This is where Gib's Grooming steps in. Based out of Colorado, the brand is changing things on the grooming front. Beard oils are just the first step. Not only are they perfect for softening and conditioning beards, but you can use it on your hair as well as your tattoos. Yes, tattoos! One of our reviewers swears that it made his semi-faded tats pop to life. Caleb used Voodoo Prince, which contains spellbinding fragrance with hints of bergamot, sage and sandalwood. "I like the subtle, clean scent of the oil, as I like something that smells pleasant, but isn't overpowering or very noticeable by other people." With a larger, coarse beard Caleb was excited to use the oil, "I liked how it helped soften the coarseness of my beard." "I have zero complaints about the beard oil itself. It helps soften my beard and keep it moisturized throughout the day, helping to alleviate flakiness." His only complaint was that even for his large beard, he felt that he could easily dispense too much product. "I didn't dislike anything about the oil itself, but the pump pumps out a little bit too much oil for my needs. I use one pump for my beard, but probably only need about 1/2 or 2/3 of the amount I receive per pump." Kyle used Bush Master, which has hints of grapefruit, tobacco flower, saffron and cedar. He noted that his close cropped beard was, "A bit smoother, and the fragrance was also nice." Brandon used Manscaper, which contains hints of musk, nutmeg, leather and vanilla, which he noted was one of his favorite things about the product. His short, trimmed beard definitely benefited from the beard oil. "...First time using a beard oil. Nice scent, rubs easily into beard. After a week of use, I can tell my beard is softer." All were in agreement that they couldn't get enough of the different scents, and that they would definitely recommend Gib's Grooming beard oils to friends. Need more proof? 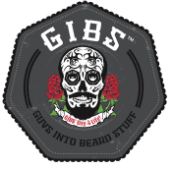 Have a Lumbersexual in your life that could use a bit of grooming? Shop it here.